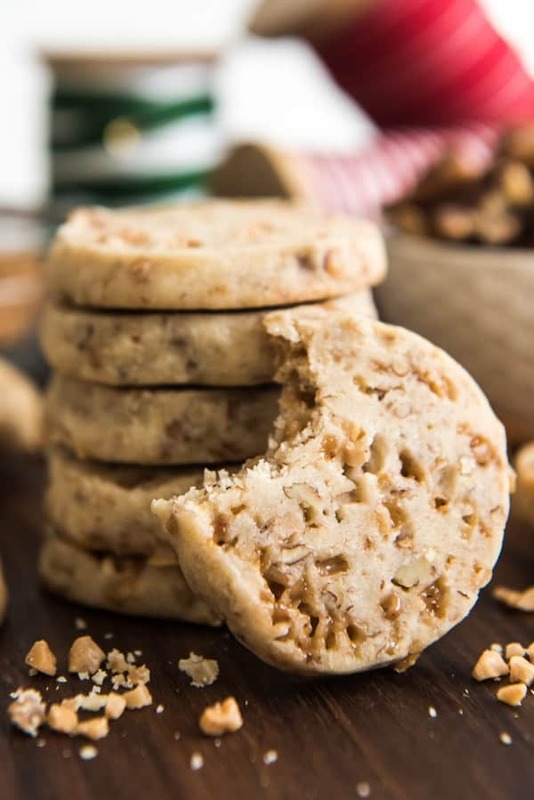 Toffee Pecan Shortbread Cookies are buttery and rich, studded with caramelized toffee bits and crunchy pecan pieces in each bite. Enjoy them as is or dip them in melted dark chocolate for an extra special Christmas cookie around the holidays! Remember those Fresh Cranberry Shortbread Bars I posted about last month? They were so delicious that I just couldn’t resist sharing another shortbread variation this holiday season as my second recipe of Cookie Week! 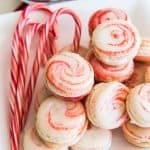 If you missed my first Cookie Week post, be sure to check out these Peppermint Macarons after reading this recipe for toffee pecan shortbread cookies or view all Cookie Week posts! Really, these are almost the exact same cookie base as those fresh cranberry shortbread bars. 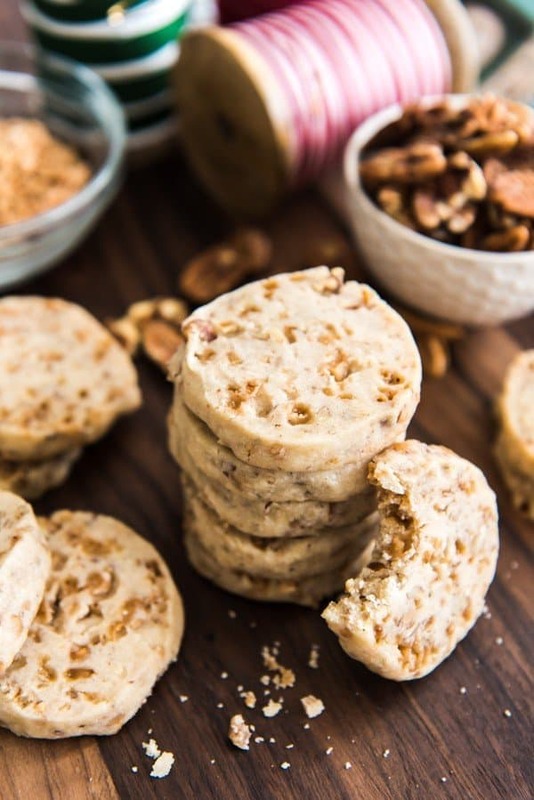 If you compare the recipes, I’ve just cut the recipe in half, swapped out fresh cranberries for toffee bits and chopped pecans, and rolled the dough into a log so I could slice the cookies into rounds instead of baking them as bars. But other than that, the ratio of butter to flour to sugar are the same. Which makes sense because shortbread traditionally has a fairly standard composition. I did opt to swap out the granulated sugar for powdered sugar, which is less traditional, but I thought it worked really well in these! The toffee bits sort of melt in the cookies as they bake, creating little pockets of chewy, almost caramelly, deliciousness. Toffee is one of my favorite Christmas flavors and I think it gets overshadowed by some of the bigger, more in your face flavors of peppermint, cranberry, gingerbread, and eggnog. Not to worry though, this isn’t the only toffee cookie recipe you will be seeing from me this week! Be sure to chop your pecans well so that the pieces are very small, about the same size as the toffee bits. Otherwise the cookies are more likely to crumble apart when slicing or after they are baked. The pecans should flavor the cookie as much as the toffee instead of standing out as big chunks. Compress the dough into logs by squeezing it with your hands to make sure there aren’t pockets of air in the center. I use a ruler to measure my dough rolls to make sure they are each 6 1/2-inches long before wrapping them up in plastic wrap and refrigerating to firm the dough before slicing into rounds. 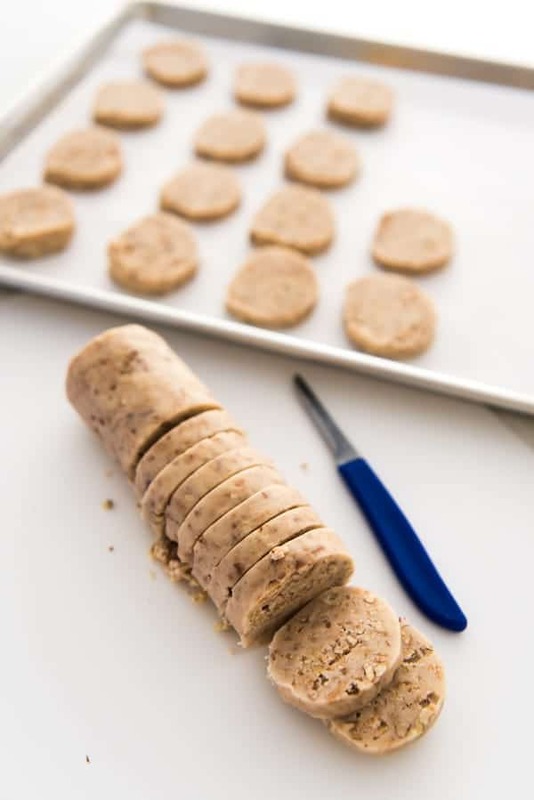 Not only does this make the shortbread dough easier to slice, but it also results in about 28 cookies that are consistently the same size, about 1 1/2 to 1 3/4-inches in diameter. 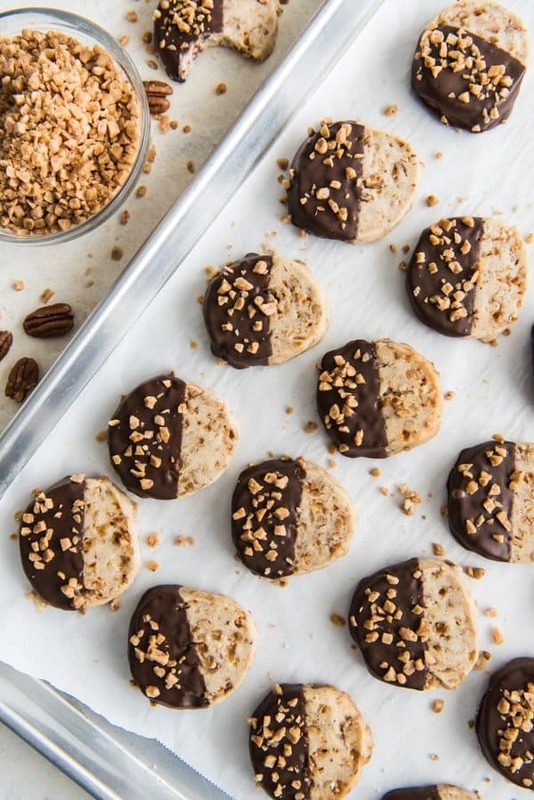 Honestly, while I am completely obsessed with these toffee pecan shortbread cookies dipped in chocolate, I think I prefer them plain. 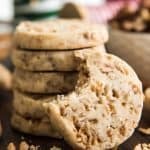 They are fantastic either way, but I tend to just really, really love the butteriness of shortbread and how the toffee and pecan flavors come through in the unadorned version. Paul definitely prefers the chocolate-dipped variety though, which is no surprise. 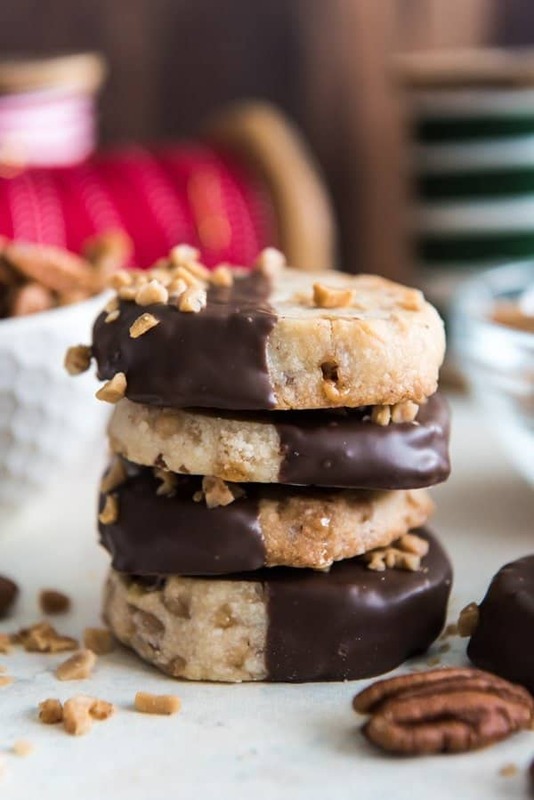 You really can’t go wrong either way, and I will admit that dipping these toffee pecan shortbread cookies in melted dark chocolate and sprinkling them with some extra toffee or pecan bits gives them a wow factor that people go crazy over, especially if you are planning to take these to a Christmas cookie exchange party or deliver them to neighbors and friends. These shortbread cookies don’t need the chocolate though and it is certainly the most time-consuming and labor intensive part of making this otherwise super easy cookies (not that’s it’s difficult to melt chocolate in the microwave for a minute and then dip cookies in it, but still). And you might find that, like me, you enjoy these even more plain, even if the chocolate-coated ones are irresistible as well. 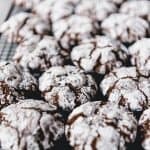 In fact, you can dip most ANY cookie in melted dark, milk, or white chocolate for an even more impressive dessert cookie that takes them from everyday to extraordinary. Try dipping chocolate chip cookies in milk chocolate or gingerbread men in white chocolate instead of icing them with royal icing! If you would like to use real chocolate and want to go to the trouble of making sure it is properly tempered, this tutorial will help. But when it comes to holiday baking and cookies, I often just take the easy way out and use the chocolate melting wafers from Ghiradelli, which are actually quite delicious. Honestly, I’m completely obsessed with these cookies. I didn’t grow up with shortbread as a cookie that we made during the holiday season and have only discovered it in recent years and now I can’t get enough! 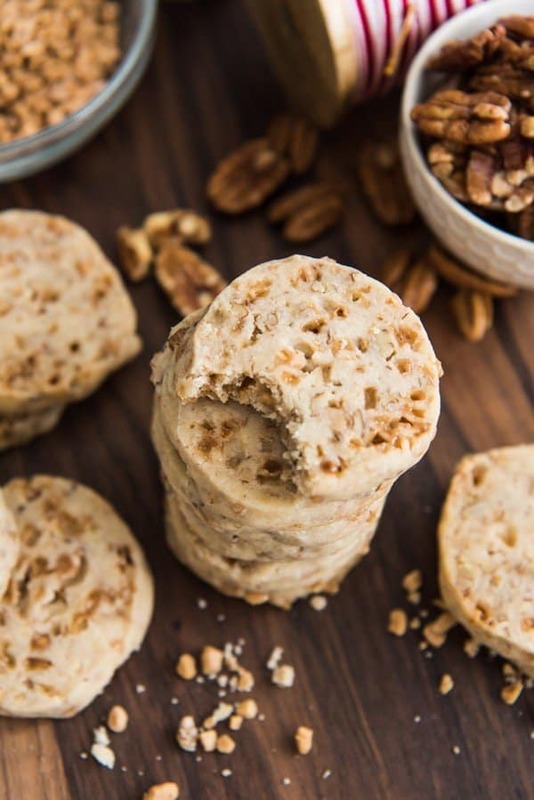 And these toffee pecan shortbread cookies are definitely going to be a must make cookie for all future Christmases! Don’t forget to keep scrolling after the recipe to see the other contributions to #CookieWeek by some of my food blogging friends! 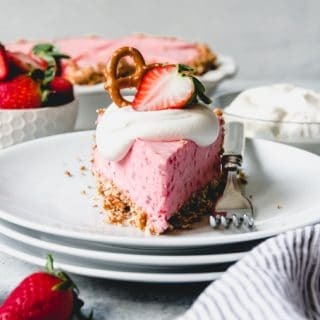 Combine the cold butter and powdered sugar in the large bowl of a stand mixer and beat until smooth and creamy, scraping down the sides of the bowl as needed. Mix in the vanilla and salt, then slowly add the flour on low speed, mixing just until the dough comes together. Stir in the toffee bits and chopped pecans, then divide the dough into two even-sized portions and shaped into logs that are each 6 1/2-inches long and approximately 1 1/2 to 1 3/4-inches in diameter. I find it's easiest to squeeze the dough tightly to compress and make sure there aren't any air pockets in the center, then roll it out on a lightly floured surface until it's the right size. Wrap each log tightly in plastic wrap and refrigerate for 1 hour until chilled. Heat oven to 350 degrees before removing the shortbread dough from the fridge. Line a baking sheet with parchment paper, then slice each log into 14-15 slices, each slightly less than 1/2-inch wide. 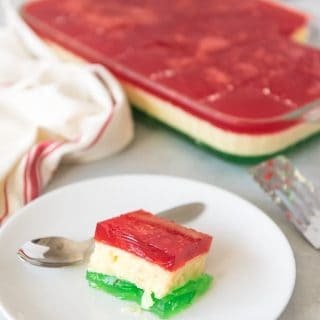 Arrange the sliced shortbread dough on the prepared baking sheet, then bake for 12-16 minutes, until just barely turning golden brown around the edges. 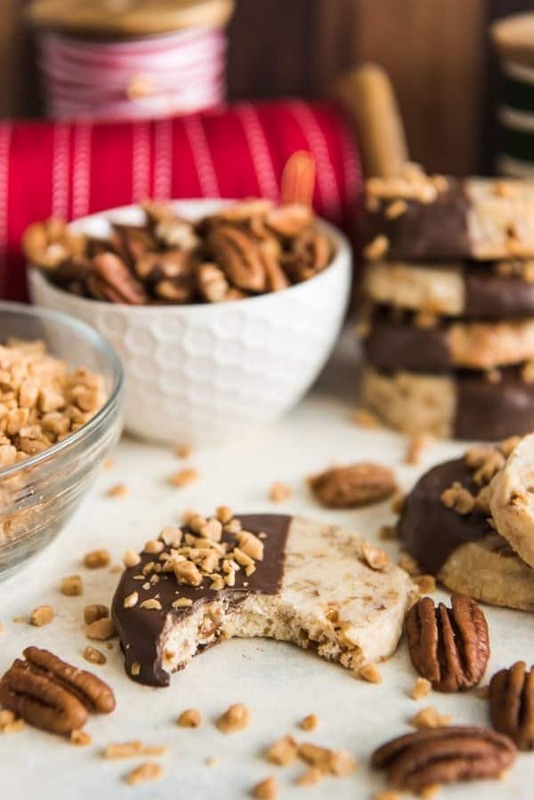 If you choose to dip the cooled toffee pecan shortbread cookies in chocolate, melt the chocolate in a microwave-safe bowl for 20 seconds at a time on the defrost setting, stirring between each burst of heat, until completely melted. Dip half of each cookie in the chocolate, then shake off the extra and lay flat on a parchment-lined baking sheet. 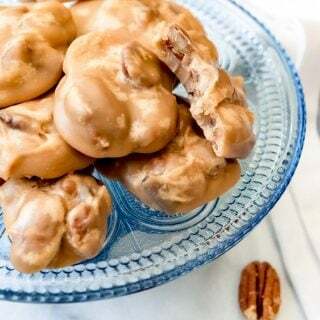 Sprinkle with additional toffee bits or chopped pecans before the chocolate has a chance to set, then allow the chocolate to set completely for about an hour at room temperature or in the refrigerator for quicker results. 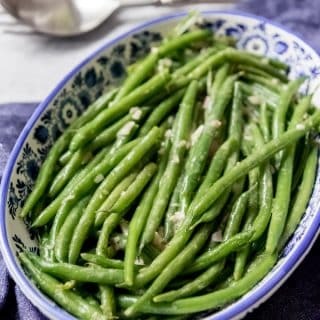 Store in an airtight container for up to 5 days at room temperature. These cookies also freeze very well. 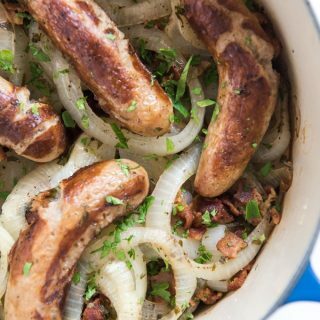 Recipe inspired by both Cooking Classy and Baking and Boys. This is a cookie that could totally steal my heart away! 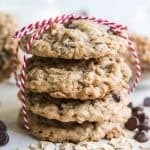 I love all of the crushed up bits of toffee in these cookies! These cookies are making my mouth water! I think I would like them with chocolate or without. Either way looks amazing! 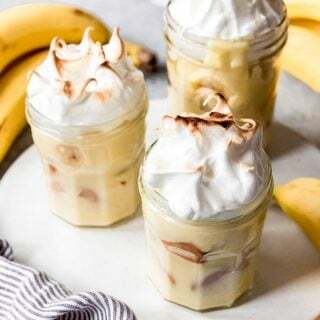 Everything about these is calling my name!! I’ll be making them soon! Wow my boyfriend would go absolutely crazy for these! 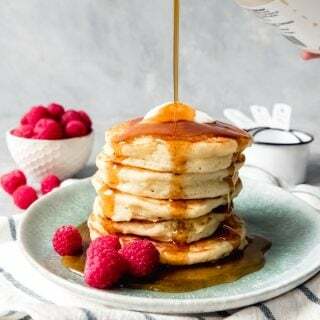 Wonder if I could try to make a dairy free version of these and still have them hold up without the butter! I think I’ll take the frosted ones as well….if you can convince your husband to share. 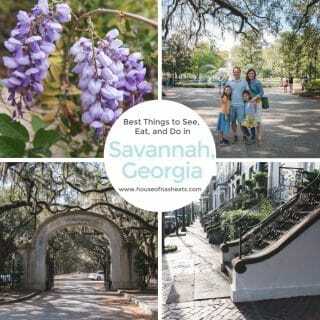 Love the cookies, the flavors, the photos, and the stunning food styling! Can’t wait to try these! What type of Toffe did you use? There are a couple different kinds, but the one I happened to grab this time were the Heath English Toffee Bits. You could also just make a batch of homemade English toffee without the nuts and chocolate and crush that up to use. Amy, I can’t buy toffee bits here. Is there another option? Can I cut the caramel candies? Caramel won’t turn out the same as toffee, although I’m sure it would be delicious as well. Maybe hard butterscotch candies broken up? The only other thing I can think of is to make a batch of homemade toffee without bothering with the nuts and chocolate, then crushing that with a rolling pin or mallet into bits. My toffee recipe on the blog would work really well, and it isn’t difficult at all, especially if you are omitting the nuts and chocolate! There is a search bar at the top right of the blog that you can use to look for “toffee” or just google “house of nash toffee” and it will come up!